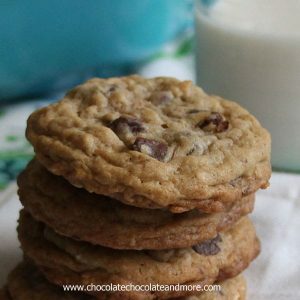 Butter Pecan Cookies - Chocolate Chocolate and More! 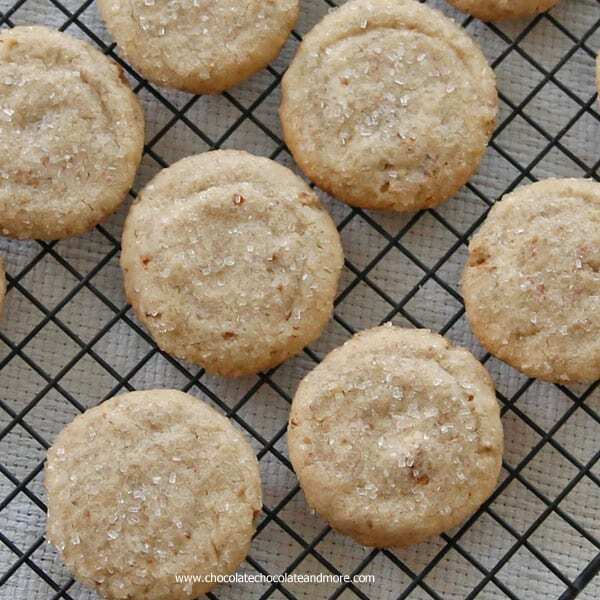 Butter Pecan Cookies-the combination of toasted pecans and butter makes this crisp cookie a classic. Sometimes you just crave the classics. This weekend was one of those weekends. The kids were gone. It was cold and windy outside. All I wanted to do was curl up on the sofa with the dog and watch movies. Not the latest releases. Honestly, I haven’t even heard of most of the newer movies. I like the movies from the 80’s and 90’s. That’s the great thing about the “older” movies, you know all the great lines. You look forward to them. You know what will happen at the end of the movie and you look forward to that good cry. I can’t tell you my disappointment when I go to that channel and it was a different movie. One I couldn’t identify. I ended up watching the original Footloose, the one with Kevin Bacon. That movie makes me want to dance every time I see it. Then I found Moonstruck . I’ve never been a Cher fan but that woman can act. I also love her in the movie Mask . Talk about a tear jerker. She also gets the best co-stars. Nicholas Cage and Sam Elliot, yummy. Now, I’m not one to really just sit around all day on the couch, eating popcorn and watching movies. So I made cookies. Something simple, something easy. A Classic. 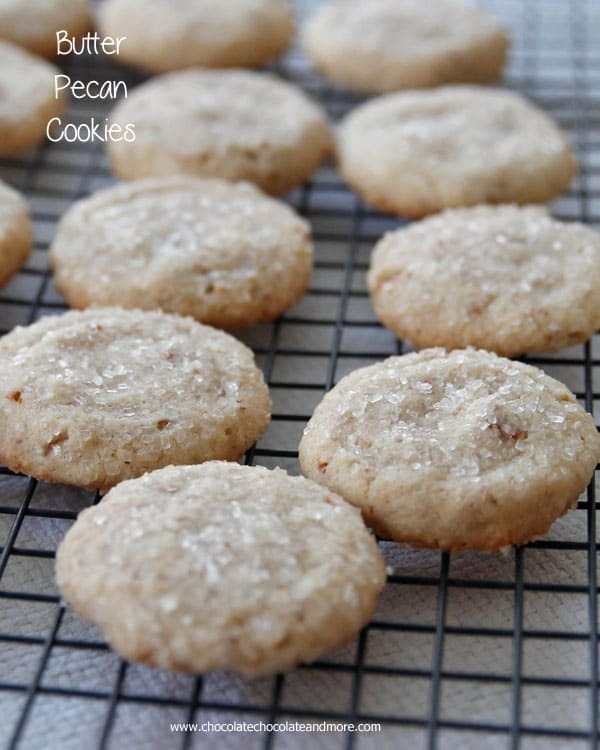 Butter Pecan Cookies. And then I sat around eating cookies and watching movies. Toast pecans by spreading out on a baking sheet and baking in a 350 degree oven for 5-6 minutes. Remove from oven and let cool completely. Chop finely and set aside. Cream butter and sugar together until fluffy. Add vanilla extract and beat again. Slowly add in flour and salt until completely combined. Place decorating sugar in a small bowl. Using a medium cookie scoop, spoon out cookie dough and roll into a ball. 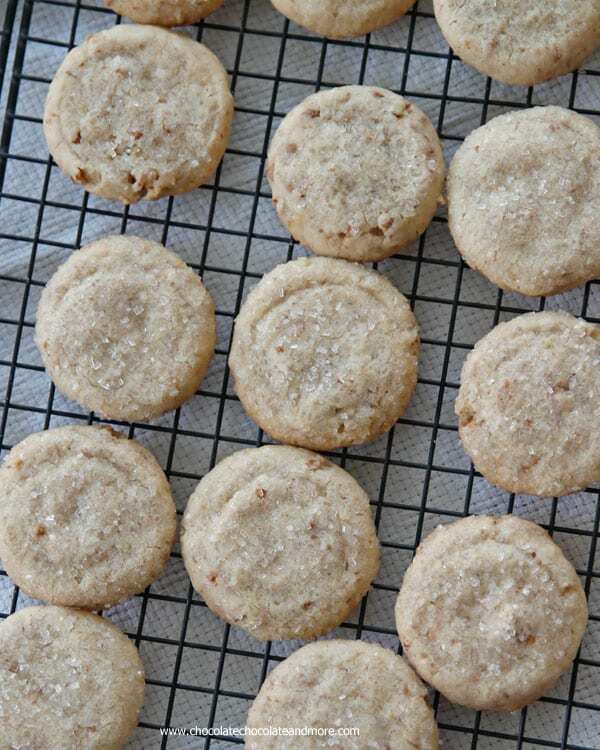 Roll top of cookie ball in decorator sugar and place sugar side up on an ungreased cookie sheet. 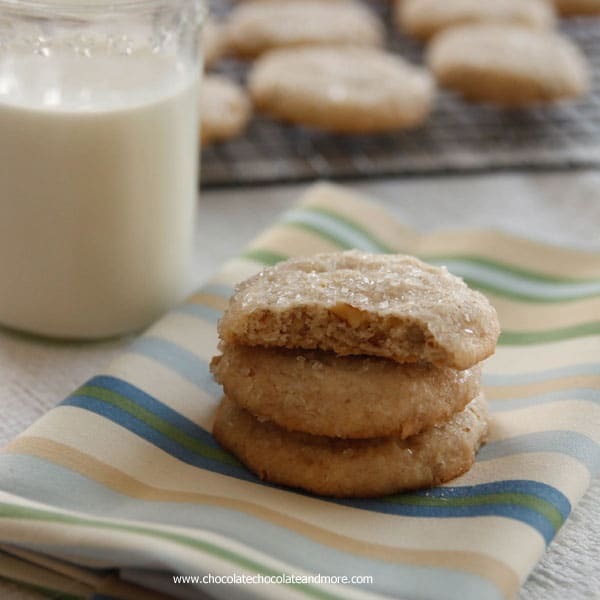 Use the bottom of a glass to gently flatten cookies. Bake in a preheated 350 degree oven for 12-14 minutes, just until edges start to brown. 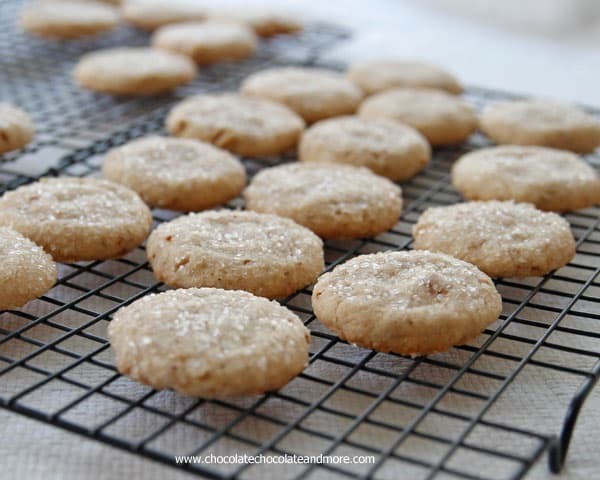 Remove from oven and let cookies cool on baking sheet for 10 minutes before removing to racks to cool completely. The classics really are the best! Steel Magnolias. Sob sob. Love that movie! These cookies are the quintessential classic ~ thanks for sharing. Pecans are the best. Maybe that’s why I do love those Waffle House waffles (just not their sanitation…..hello low standards!). Anyhow, I liked the sugar sprinkled on top. I have some red sprinkles for Valentine’s Day that would look really pretty on top to I think =) Except, I have 2 dogs and a cat to snuggle with on the couch, so it gets crowded!! You make me want to eat butter pecan cookies and watch movies all day too; all the movies you just named are my FAVORITE! I could watch Moonstruck over and over again! What a great day Joan and what a great,classic cookie! Joan, these are my favorite cookies; so rich and buttery. I like the classic movies as well and just watched Dirty Dancing recently myself. Can’t wait to whip up a batch of these. Thanks for sharing the recipe. I made these for my cookiie trays that I give away at Christmas time. they are fantastic and the dough froze beautifully (I made it in advance). Loved them and will definitely make them again and again. These cookies look delicious! So yummy!!! I love older movies too-always have! 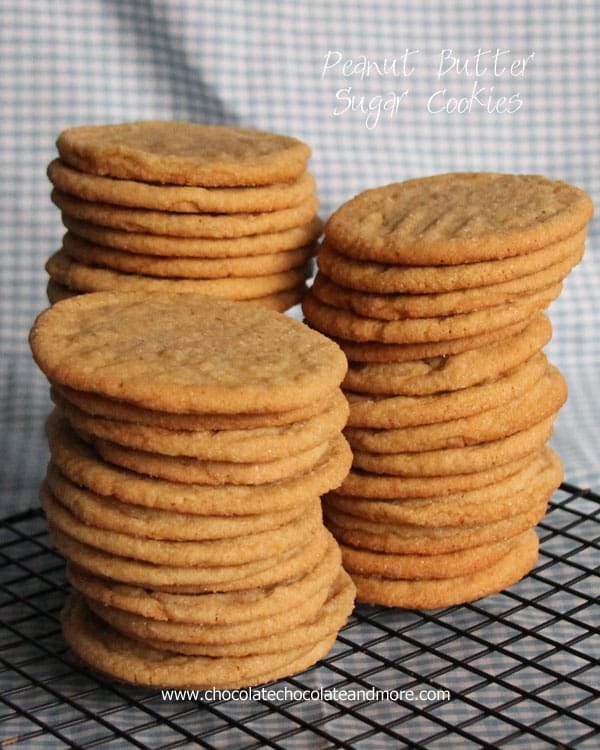 and I love these cookies-so buttery and crisp! 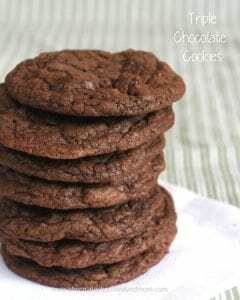 This recipe maked about 30 cookies depending on how big you make them. 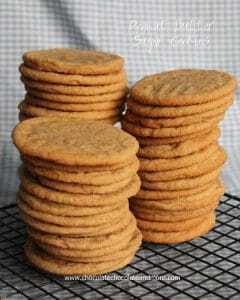 My favorite cookies. What is the amount of salt that’s needed? It’s 1/8 teaspoon of salt, I’ve updated the recipe, thanks for catching that. Your recipe Indic a tes to add salt with flour in the directions, however there is no salt amount indicated in the ingredients. How much salt please? Thanks – really like so many of your recipes and posts. Thanks for catching that, it’s 1/8 teaspoon or a pinch. I’ve updated the recipe. great recipe. I look forward to baking them. 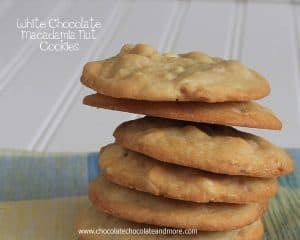 Even though this is a classic cookie recipe, I have never made it before! Looks delicious! I love the cookies. Finally now I have the recipe to make them. Thanks so much. U r great! God Bless U.
I would like to make a suggestion. I think everyone will agree to this. Why don’t u put a Recipe Box on here. So we can store our recipes U make. I’ve been putting them on my F/ B so I will have them. Then I can go in & write them down. Thanks so much for hearing me out. Hi Jackie, I used to use Ziplist so everyone could store the recipes that way. Ziplist discontinued the program. Until I find another “user friendly” version for a recipe box, you’ll have to either print the recipes out, pin them on Pinterest or save them as you have been doing on FB. Sorry for the inconvenience. Hi Joan, I have been checking your website for quite a while, but never signed up to receive every recipe. Well, I just changed that. You have the most delicious sweets recipes. Of course, I am addicted to sugar and I love chocolate the best, but I bake quite a bit and try to give a lot to others. Cant wait to get any new recipes you have to share. I’m a big fan of classic and simple. Pinning these pronto! Thanks for linking up with Best of the Weekend!